Turn over a new leaf: we offer hundreds of green colours for every style of home, from fresh and mossy hues to deep emeralds and forest greens. 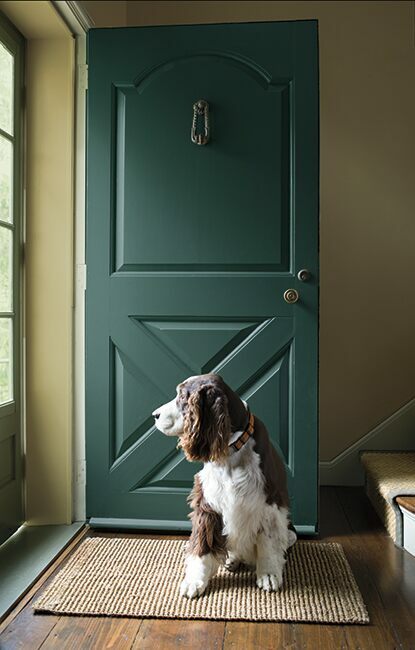 Whether online or in-store, let us help you find the best Benjamin Moore shade of green paint for your next project. Infinitely versatile, green paint is a homeowner favourite, with muted greens adding nature-infused tranquility, and brighter ones offering sophisticated charm. Here are some of our most popular shades of green including Guilford Green HC-116, the Benjamin Moore Colour of the Year 2015. Soft green hues are always popular in home interiors, creating relaxing bedrooms, spa-like bathrooms, and soothing green living rooms. 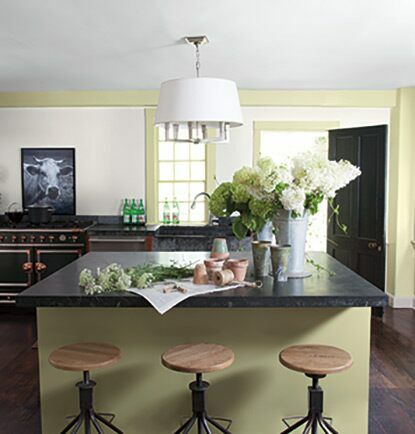 In the kitchen, on both walls and cabinetry, green is a much-loved colour. With its tie to nature, green connotes a healthy energy perfect for cooking, snacking and sipping. Throughout any home, pale greens make a great alternative to white. Halo OC-46, and Meadow Mist OC-134 are both light green paint colours that are breezy and inviting. Silvery greens like Titanium OC-49 and Gray Cashmere 2138-60 deliver a sense of Zen to any space, adding a touch of distinction. The colour in paint comes to life by mixing two hues or more. An undertone is the result of the prominent colour taking visual precedence. The best way to identify undertones is by doing a side-by-side paint chip comparison. Yellow and blue, both members of green’s family tree, are the core undertones to look for when considering green. Here, a green door has deep blue undertones, while the wall behind it appears citrusy thanks to yellow undertones. The wide variety of undertones in the green family offers endless possibilities for dynamic monochromatic schemes. "VERDANT COLOURS BRING A TOUCH OF NATURE INDOORS." On the colour wheel, the complementary colour to green is red, a colour combination that opens up opportunities for playing with tone and saturation. For example, consider the softer edges of red–think a light blush–when approaching this lively colour scheme. Here, a ceiling in the palest of pinks pairs beautifully with walls painted in subtle shades of olive green. 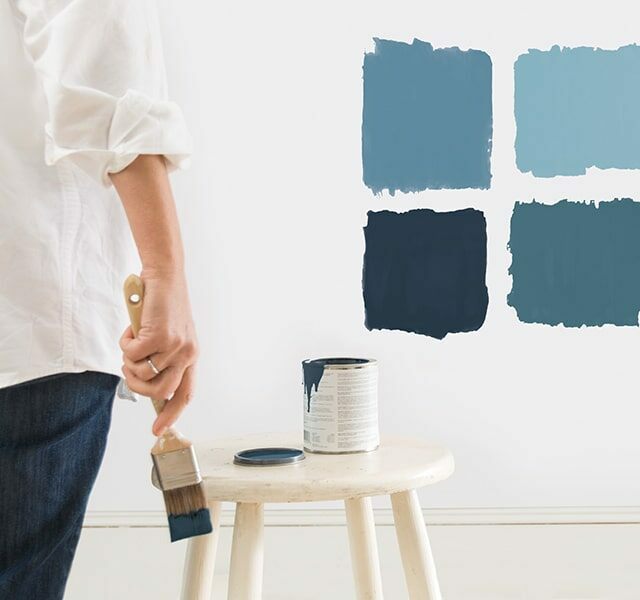 Green paint colours go deeper with jewel tones, creating elegant contrast against almost any neutral shade, including white, gray, beige and black. 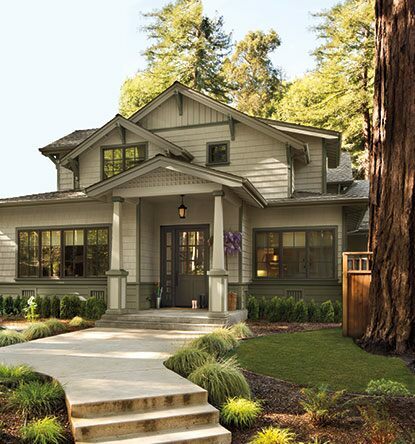 The right hue of green paint on a home’s exterior synchronizes with natural surroundings while adding design interest that transcends the classic white or off-white exterior. 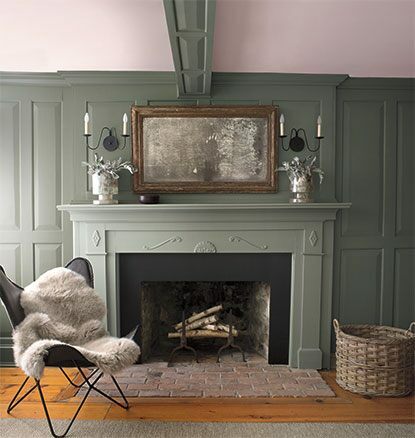 Here, trim and accents painted in earthy Gloucester Sage HC-100 harmonize seamlessly with the warm tones of Sag Harbour Gray HC-95. 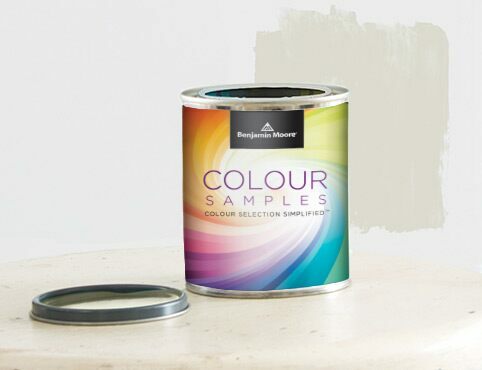 Test your paint colours from morning to evening, under both natural and artificial lighting conditions.